Located just west of Long Pond, Mansell Mountain and Bernard Mountain (collectively known as "Western Mountain") have several trails leading up to their peaks. The most interesting is the Perpendicular Trail, a steep and dramatic route made of many precisely-positioned stone steps that work their way up a steep boulder field to the top of Mansell Mountain. 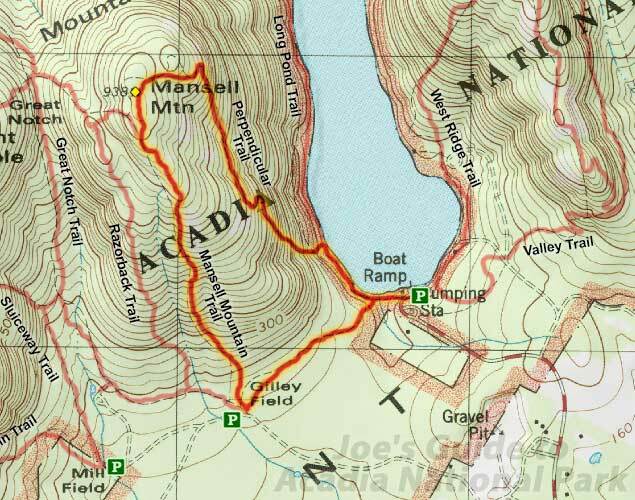 Although not as vertical as its name might imply, this is still a great hike on an amazingly engineered trail and it offers great views of Long Pond and Beech Mountain in the distance. Length: 2.5 miles total for loop hike. 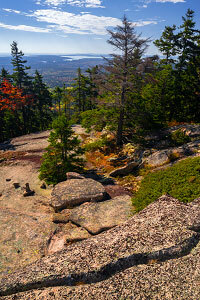 Elevation Change: 850-ft elevation gain to summit of Mansell Mountain. To get to the trailhead, drive Route 102 to Southwest Harbor. Just north of downtown Southwest Harbor, take Seal Cove Road west for .6 miles, then take Long Pond Road north for roughly a mile. The road ends at the beautiful south shore of Long Pond. 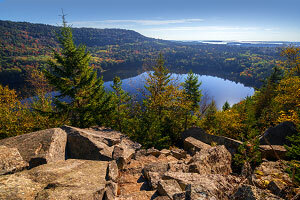 Although Long Pond isn't as well known as Jordan Pond, Eagle Lake, or Echo Lake, this is a popular spot for kayakers. Parking is limited, so on crowded days, you may need to park up the road a bit. Look for the Long Pond Trailhead marker near the pump house and follow the pleasant lakeside trail as it heads roughly northwest around the pond. In only .2 miles is the junction with the Perpendicular Trail. Here is where the fun begins! Follow the Perpendicular Trail up the seemingly endless series of steps that quickly ascend a massive boulder field. The craftsmanship of this path and the placement of the steps and borders is amazing and is seemingly much more detailed than need be. After climbing up several hundred feet, there is one section of iron rungs and a short ladder, but it is not at all exposed like the Beehive Trail or Precipice Trail. Roughly halfway up the mountain, the rate of ascent lets up a bit and the trail enters a forested section of Mansell Mountain. Near the summit is a short little viewpoint spur trail that offers good views of Long Pond and Beech Mountain to the east. The trail continues through a forested marsh and then reaches the summit marker, although the highpoint is forested and doesn't offer any views. From the top of Mansell Mountain, there are several trail options to get back down, the simplest being the Mansell Mountain Trail which offers some pleasant views as you descend to the south. As the trail reaches the bottom of the mountain, it ends at a dirt road/parking area. Look for the Cold Brook Trail and take it east back to Long Pond. I have to admit that the first time I did this hike, I was a little disappointed because the name "Perpendicular Trail" conjured up images of sheer drops and exposed ladders (like the Precipice Trail), but this route is nowhere near as breathtaking and it doesn't have a stunning viewpoint like many other Acadia peaks. Perhaps better thought of as the "Amazingly-Crafted Steps Trail" or the "Diagonal Trail", this still makes for a pleasant day hike.